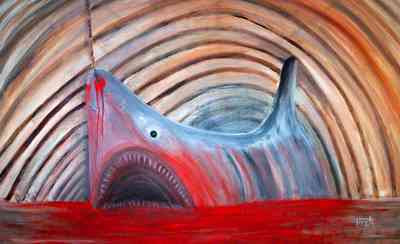 Still on today's theme of wildlife, this gruesome painting by Fizza Abdulrasul is a protest against the maltreatment of sharks, entitled Stop! Agony, Despair and the Colour of Cruelty (2009). Thousands are caught for sharks fin soup. Their fins are cut off while they are still alive and they're thrown back into the sea to suffocate. (Without the ability to swim, sharks cannot pass enough water through their gills to extract oxygen.) I featured Fizza's art two years ago (CLICK). She has since changed her website and URL. Click the title link to visit a gallery of her art.